Media coverage of the midterm elections has painted a picture of two parties, irreconcilable in nearly all respects. But are they? We selected a handful of Democratic and Republican campaign ads from across the country, and tested them for the second-to-second, gut reactions of 560 American voters. Media coverage of the midterm elections has painted a picture of two parties, irreconcilable in nearly all respects. But are they? Together maslansky luntz + partners, and Roy Morgan Research selected a handful of Democratic and Republican campaign ads from across the country, and tested them for the second-to-second, gut reactions of 560 American voters. We wanted to take these campaign ads directly to the people and get unaided reactions to the messages and imagery. We wanted to focus on individual ads not the overall race, so we showed voters ads from a range of contests around the country. We used technology to tap into voters’ emotional responses to understand exactly how voters feel when they see these ads and hear these messages. And as far as we know, no one has ever tested campaign ads in this way before with so many voters. Even in these incredibly polarizing times, with midterm candidates accusing each other of everything from being “too Washington” to being members of the Taliban (seriously), there are messages that resonate with Republicans, Democrats, and Independents alike. 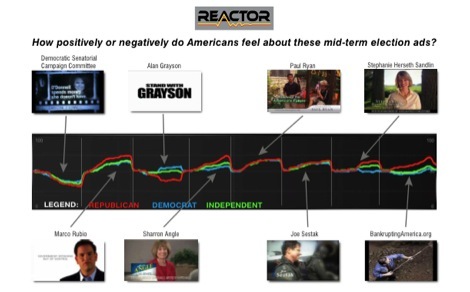 Our conclusions are below, but we invite you to be the judge yourself–take a look at the second-by-second reactions of voters (separated by Republican, Democrat and Independent) as they watched 8 campaign ads. “Government isn’t the solution to our problems, government is the problem.” It’s no surprise Republicans score this line – from Nevada Senate candidate Sharron Angle – the highest of all messages tested. What’s surprising is the positive reaction this old Ronald Reagan gem generates even among Democrats. Remember the 2008 primaries, when Hillary Clinton excoriated Barack Obama for even mentioning Reagan? Today, across the board, Democrats are tending to react positively to traditionally Republican messages about smaller government. “Washington isn’t just broke; it’s broken.” This line, from Marco Rubio, does the second best of any in the group. Rubio, the Republican Senate candidate from Florida, scores extremely well with Republicans, while also generating strong positives from Independents and Democrats with his anti-big government message. Running just as fast as she can. We’ve seen a number of candidates on both sides trying to distance themselves from the national party. South Dakota’s Democratic candidate, Stephanie Herseth-Sandlin is doing just that- and the message seems to be working. Though her ad is one of the most polarizing we tested, it worked with Republicans (who dominate her state), while falling flat with Dems. Problems vs. Solutions. We know there are problems. And we’re tired of hearing about them. The candidates that focus on solutions win. Rep. Paul Ryan of Wisconsin’s Roadmap for America’s Future scores well across the board with a solutions-oriented approach to our country’s challenges. Meanwhile, BankruptingAmerica.org ran an ad that spent 30 seconds defining our problems as a big $13 trillion hole in the ground, and presented as a solution merely that we “stop digging.” While it does very well with Republicans, it generates only muted response from Independents and Democrats. Admiral Sestak. Rep Joe Sestak pulls out the big guns in a salute to his military record in his fight for the PA Senate. Though bio ads often fail to generate strong enthusiasm, this ad shows how well Sestak’s backstory plays with Republicans and Democrats alike. Unfortunately for him, his bio probably isn’t going to be enough to overcome what he’s done for Pennsylvania lately: support the Obama agenda in an election year where domestic concerns about spending dominate. Failed attack. People tend to react negatively when they hear a negative message about someone. So it is no surprise that all voters react negatively to the DSCC’s attack on Christine O’Donnell’s “financial irresponsibility.” Attack ads only work when they generate partisan support for the attacker. There is none of that here. This ad isn’t likely to do anything to O’Donnell. Apocalypse, Thy Name is Grayson. Sometimes you just have to test the outrageous ads to see how people will respond. Rep. Alan Grayson of Florida certainly fits the bill. His “When they lie” ad, which plays like the trailer for a modern remake of Apocalypse Now, attempts to equate him with Truth incarnate. It doesn’t work. Calling Republicans liars generates their expected negative response. But where this ad really fails is its inability to fire up Democrats. They barely registered positive reaction. In coming to the conclusions above, we tested 8 political ads from around the nation. They were: from the DSCC – Christine O’Donnell (R) is financially irresponsible; Marco Rubio (R) – Washington is Broken; Alan Grayson (D) – When Republicans Lie; Sharron Angle (R) – Government is the problem; Paul Ryan (R) – A Good Start; Joe Sestak (D) – Naval Career; Stephanie Herseth Sandlin (D) – Standing Up to Party Leadership; and Bankrupting America.org – Stop Digging.